My own twist on a sunny sky. I started this sunflower plant from a tiny seed and now it towers over me. The flower just bloomed yesterday. This is its first morning stretch towards the rising sun in the east. I love sunflowers and this sunflower with the clouds is amazing! Have a great day! Well done. And a good photo as well. GREAT! Love your creative spirit shown here! Fantastic capture, beautiful sunflower and lovely skies!! Doesn't get any better than this! Happy SWF! Hope you have a great weekend! Enjoy! it's a winner. very happy and beautiful skies. happy day to you. Great photo of a great sunflower!! Boom & Gary of the Vermilon River, Canada. Neat Idea..if the Sun does not come out on it's own....let a Sunflower take it's place. Great photo for SWF!Sunflowers are one of my favourite flowers! this is just so beautiful, quintessential summer sighting. It blows my mind how big Sunflowers grow from those tiny seeds! Great picture. Beautiul sunflower and a beautiful sky! How wonderful for you to capture it in all its new glory against such a beautiful sky. Well done. That is the sun in the sky here too. Nice shot. Gorgeous shot! 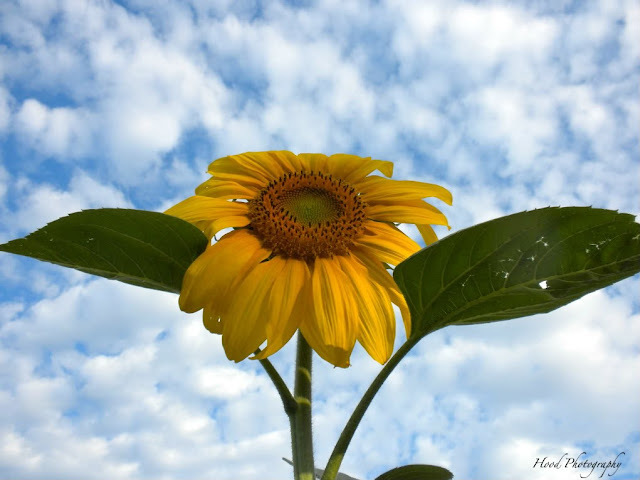 I love looking up into the sky, and your sunflower makes you do that!!! That is so cool! don't you love it when something you planted flourishes....I Love sunflowers...you have captured it well! One of my favourite flowers - and so kind to the birds as well as providing us with sunny beauty. Nice composition and your photo, too. Lovely sky in the background. I love Sunflowers and this is a lovely shot of it against the powder puff clouds. The birds will love you for planting it too. How tall is that flower? It's pretty awesome against the sky. Clap. Clapping. Still clapping. Excellent shot!